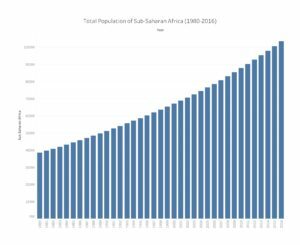 Africa’s population is growing and quickly. Even those who are generally unaware of happenings on the continent, will be alert to the fact that half of the world’s population growth is projected to be in Africa by 2050. This strikes fear into all but an optimistic few. The fear comes from an assumed correlation between the size of the youth population and insecurity popularized by the “youth bulge” hypothesis. The youth bulge is defined as “20 percent or more of the population in the 15 to 24 age group.” As a result, there has been no shortage of experts who have drawn on this hypothesis to opine on the potential of Africa’s youth for violence. There are two major problems with this. First, most researchers and commentators use aggregate numbers for Sub-Saharan Africa, which is misleading and largely inaccurate. 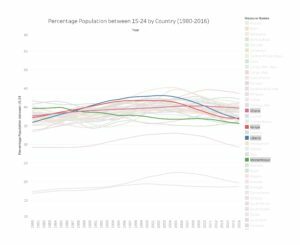 Second, the data show that almost every country in Sub-Saharan Africa has consistently maintained a population of 15-24-year-olds well over the youth bulge’s 20 percent threshold. A deeper inspection of the data eliminates a correlation between the percentage of youth in African nations and violence. Although its has earlier origins, the concept of the youth bulge took off in the 90s and early 00s. 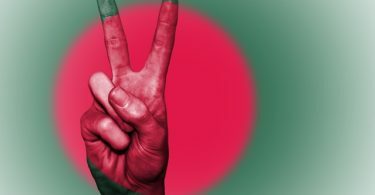 The end of the cold war, a spike in violent conflict, and an increased focus on peace and peace building are just three reasons why the concept gained increased traction. Perhaps more importantly, at least in the African context, this was a time when there was a legitimate increase in the percentage youth population in a number of countries. 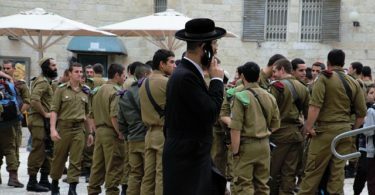 Despite some debate over what age group and percentage of the population are connected with instability, an alarmist understanding of the youth bulge has persisted. Along with the use of aggregated data, this stubborn consistency has resulted in a concept mostly inconsistent with the realities of the data. Lumping continental population and “Africa’s youth” under a single category obscures the realities of population growth on the continent. 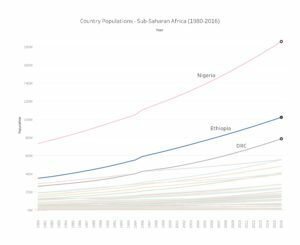 The fact is that Nigeria, Ethiopia, and the Democratic Republic of Congo (DRC) are by far the largest and fastest growing countries in terms of population. Across these countries, growth suggest that we should expect population concentration in specific areas, not continent wide. This understanding changes the calculus on what factors are central in this context. For example, one might expect a relationship between urbanization and conflict to be a more important notion than the youth bulge. In fact, the land conflicts related to the expansion of Addis Ababa could be seen as an indication of this. The second issue is the belief that there is still a youth bulge in Sub-Saharan Africa. Looking at the current percentage of population between 15-24, there is indeed a youth population well over 20 percent. 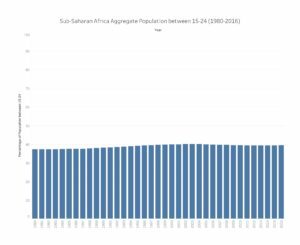 However, underlying this data point is the understanding that almost every sub-Saharan African countries’ 15 to 24-year-old demographic has been over 20 percent for at least the past 36 years. Additionally, when the data are disaggregated by country, it is evident that the percentage youth population levels vary enormously. 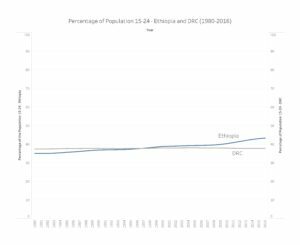 In comparative terms, the percentage of youth in Ethiopia has risen dramatically, while the DRC’s percentage of youth has remained remarkably steady, despite its significant population increase. In most cases, like the DRC, this percentage youth population is the norm. Across Sub-Saharan Africa, countries and their historical youth populations vary significantly, while the majority of Sub-Saharan countries remain consistently within a youth percentage population band of 35 to 45 percent. Looking at Ghana, Kenya, Liberia, and Mozambique (Figure 5), four countries in different parts of the continent with different histories and levels of violence, it is clear that each has maintained a youth population well over 20 percent since at least 1980. Additionally, each shows a different ebb-and-flow of the percent youth population. For example, Kenya and Liberia do have a “bulge” look to their historical trend line, which has now fallen. On the other hand, Mozambique shows a steady decline in the percentage of their population categorized as youth. The reality is that only a few countries are driving the population growth on the continent, and that the majority of sub-Saharan countries’ populations between the ages of 15 to 24 continue to remain high. 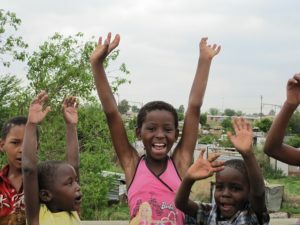 The consistency and ubiquity of Sub-Saharan Africa’s youth populations at a level between 35 and 45 percent of the population appear to invalidate the original definition of the youth bulge concept. 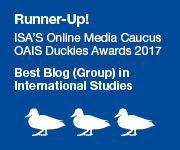 The implication is that the peace and security field needs to look to other theories to explain the presence of a high risk of conflict. DRC is the only one that cracks the top 10. *List based on average annual growth rates 1980-2016 using data from the World Bank. That is a good point, but the idea that the greater sub-Saharan African population bulge is being led by the smaller high growth population countries seems to be undercut by the fact that larger with lower growth populations have a population scale that is outpacing everyone and they aren’t far behind the general percentage growth. For example, while Equatorial Guinea’s population grew by 4.78x between 1980-2016 it only grew from approximately 255,000 to 1,221,000. Whereas, Ethiopia (who isn’t on the list), grew at a rate of 2.9x from approximately 35,000,000 to 102,000,000. Capping the list at 10 can also limit the fact that DRC and Tanzania grew at approximately 2.98x, not much more than Ethiopia, and Nigeria was 2.5x over the same time period.